While I’m on the subject of normal, or not, I was the kid who liked to torch his marshmallow over the campfire. While the others were pulling their sticks away, lest the puffy pellet on the end get any hint of blackness. And yup, I now know that some say you’re not supposed to eat burnt foods. But since I don’t drive a car, I don’t smoke (second-hand smoke in Paris notwithstanding…), I use free-range eggs, and I even wore the same socks two days in a row last week. (Which was an accident.) So I think it’s okay to have a over-toasted marshmallow every so often. In fact, I wish I had them more often than I do. Paris has seen a lot of American food fads cross the Atlantic, which have been embraced…actually, some over-embraced, such as caramel corn, burgers, cupcakes, fish and chips, and anything Brooklyn, but S’mores seem to have gone under the wire. It’s odd because French people love guimauves (marshmallows), chocolate, and spiced cookies – so what’s not to like about combining them? I decided to create my mash-up of those flavors in one scoop of ice cream, which I served up to some Parisian friends. I’ve been intrigued by toasted marshmallow ice cream recipes that I’ve seen. But tasting them, the flavor of the marshmallows gets muted by blending them with the custard base. So I decided to keep them separate, torch them on their own, and gently mix them into the ice cream so they stay separate along with a ripple of deep-dark chocolate fudge sauce. I reached into my “American” stash here in Paris, a magic place/drawer in my kitchen all filled with wonderful surprises, that I often forget about. Stuff like chipotle chiles, dried sour cherries, molasses, aluminum-free baking powder and tomatillo salsa is in there, because you just never know. And I had a bag of mini-marshmallows stuffed in there, for whatever reason, which was begging to be used. I often make my own marshmallows, but the store-bought ones come in handy for marshmallow-based emergencies. (Yes, those do exist. Which I guess is the reason that I had them.) And not everyone wants to make every ingredient for every recipe. There was a joke going around “Why buy it for $8 when you can make it yourself with $89 worth of ingredients and $350 in kitchen equipment?” And I have a few other kitchen drawers full of things that will confirm that I’ve been guilty of that myself. Anyone want to buy a crème brûlée iron, the kind you heat up over an open fire? I did think so. 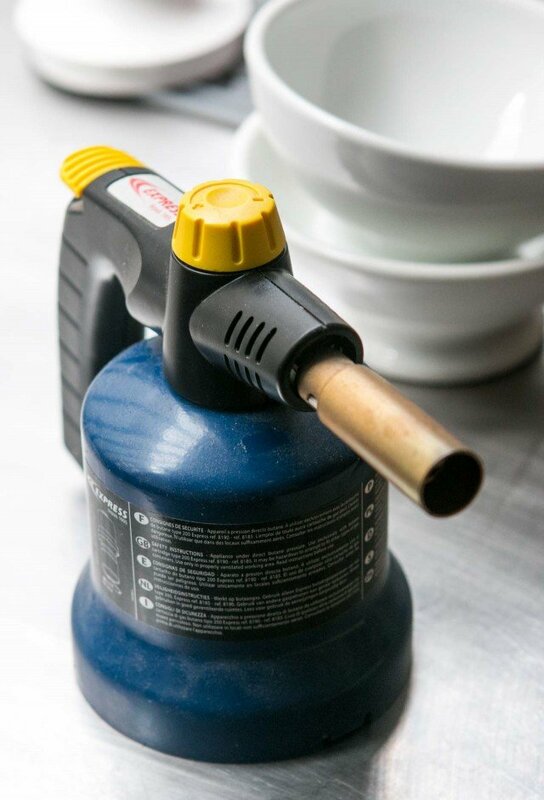 A while ago I had bought one of those mini torches that “chefs” are supposed to use, for making crème brûlée at home. But after ten minutes of waving the dinky flame over the sugar, nothing happening, and I invested in a bigger, and better, model. One that doesn’t require a roaring flame to operate. It makes its own. The only caveat is that it’s very powerful and a few of the marshmallows got charred, which I personally like. You can, of course, toast the marshmallows to whatever degree you want. I do know that the best way to burn marshmallows to a crisp is to try to photograph yourself trying to toast the marshmallows with one hand, while holding a camera and trying to squeeze the shutter at the same time. Sharp-eyed readers might notice a few here and there in the photos. 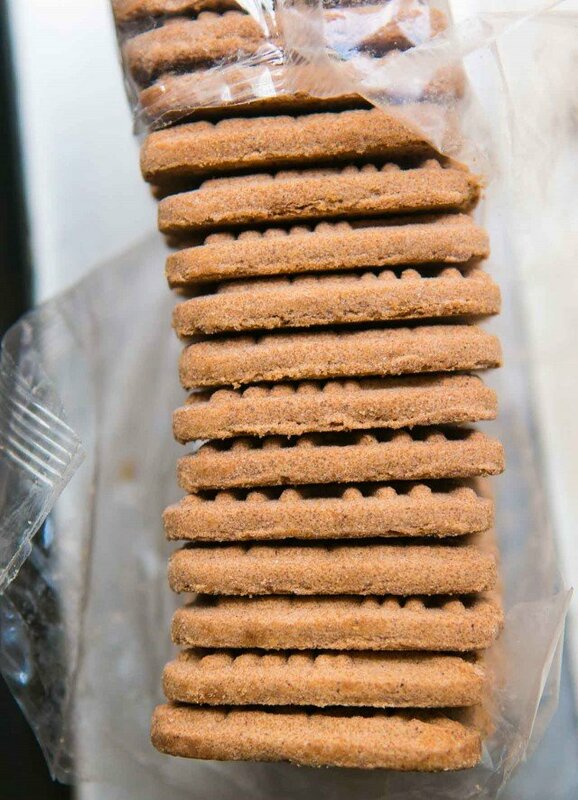 I used gingersnaps (spéculoos, in France) because we don’t get Graham crackers in France. And although I can make my own, I was so wiped out from trying to toast marshmallows while taking a picture of them that I went with store-bought cookies. For those who want to make their own, there’s a homemade Graham cracker recipe in my book, Ready for Dessert, that goes with the Lime Marshmallow Pie. Gingersnaps will add a little spicy component to the ice cream, which was rather nice with the almost-expertly toasted marshmallows and perfect fudge ripple that got swirled in ice cream. My French other-half said it tasted like something for kids. He meant that as a compliment. So you can indulge your inner enfant with this. Be sure to work fast when layering the ingredients. I like to start with putting some of the mix-ins and some of the fudge ripple in the bottom of the chilled container – marshmallows, fudge, and crumbled crackers or cookies – then add a layer with just-churned custard, then more of all three ingredients, continuing until everything is used up. Avoid stirring because you want the chocolate ripple to remain distinct. 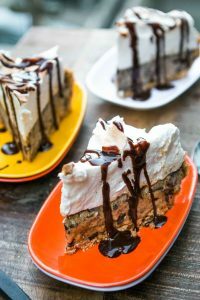 Just layer ’em all up, and when you scoop, you’ll have big, moist pockets of dark chocolate and marshmallow.If you don’t have a blowtorch, you can broil the marshmallows on a baking sheet in the oven. Watch them carefully and turn them over as they brown. Can’t get mini marshmallows? 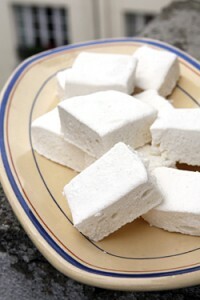 Snip large ones into quarters with oiled scissors, or make your own marshmallows. 1. To make the ice cream base, heat the milk, salt, and sugar in a saucepan. Set up an ice bath by placing a 2-quart (2l) bowl in a larger bowl partially filled with ice and water. Set a strainer over the top of the smaller bowl and pour the cream into the bowl. 2. In a separate bowl, stir together the egg yolks. Gradually pour some of the warm milk into the yolks, whisking constantly as you pour. Scrape the warmed yolks and milk back into the saucepan. 4. Strain the custard into the heavy cream. Stir over the ice until cool, add the vanilla extract. Refrigerate to chill thoroughly, preferably overnight. 5. Make the fudge ripple by heating the sugar, corn syrup, water, and cocoa powder in a medium saucepan until it starts to boil, stirring frequently. Reduce the heat and let simmer for 1 minute, stirring often. Remove from heat and add the vanilla extract. Transfer into a small bowl and chill thoroughly before using. 6. To finish the ice cream, freeze the ice cream base in your ice cream maker according to the manufacturer’s instructions. Put a large (at least 1.5qt/l) freezer-proof container in the freezer, one that you’ll store the ice cream in. 7. While the ice cream base is churning, spread the mini marshmallows on a silicone baking mat, or another heat-resistant surface that’s non-stick. Wave a blowtorch over the marshmallows carefully, just enough to brown them. 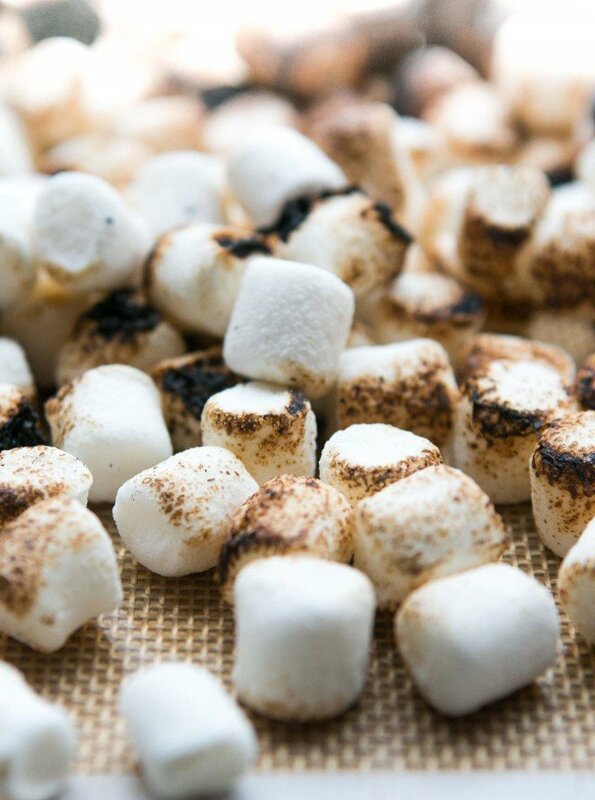 Turn them over with a spatula and continue to brown the marshmallows until they’re well-browned all over, as best as possible. 8. When the ice cream custard is ready, spoon some of the fudge swirl mixture on the bottom of the chilled container. Strew some of the Graham cracker bits over the chocolate and some marshmallows. Spread some of the just-churned custard over the mix-ins. 9. Continue to layer the churned ice cream custard spooning some of the chilled fudge ripple mixture over the custard along with toasted marshmallows and crumbled graham cracker bits. If necessary, stir it very, very, gently, just to incorporate the ingredients, but not enough to mash everything together, which will make the finished ice cream muddy. Once done, freeze the ice cream and let stand for a few hours in the freezer until firm enough to scoop. The Easiest chocolate ice cream ever! Oh this is just wonderful. I love that you used speculoos, they are my favourite cookies, I think I wouldn’t find this ice cream so appealing with graham crackers (I would like it, but not like with the speculoos). I need to try this! Really tasty looking ice cream! S’more frozen treats are the dang best! 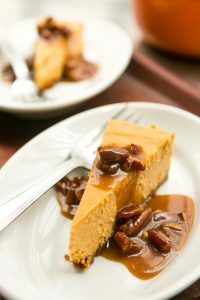 this looks so good that I am reading & rereading & thinking of excuses not to make it ;) I always wondered how to replace Graham crackers but never thought of speculoos (speculaas in Dutch). Thanks!! Ooooo, that looks S’more-ish!!! And I’m thinking that Speculoos is a sturdier cookie and might be a better choice in terms of not dissolving into goo, but I’ve never used cookies as an add-in to ice cream before. I also wonder who digestive biscuits would do–I use them when I make a version of the Prince William cake, and they hold up quite well. Despite what Deb recently said, I do not think s’mores are going anywhere! Cupcakes and macarons and pumpkin-spice everything are still around! The ice cream looks incredible. Kristin: They should work fine. If I remember correctly, they’re not spiced so if so, they won’t be as “present” in the ice cream (in terms of flavor) but they will add a nice crunch. Perhaps a teensy, tiny touch of ground cinnamon to the custard might give it that subtle boost. David, I do relish your columns and beautiful pictures. Have been lurking without comments. But when you write about dishes that have crossed the pond, I have to chip (pun intended) in. Fish ‘n Chips… Has there ever been anything more British than that. It’s not fish ‘n crisps we are talking about, after all. Had it been American it’d been fish and (freedom) fries or something. I love the metal ice cream dishes you show. They look like they came from an old soda fountain or ice cream shop. Are they a Paris flea market find? underwhelmed. It’s oddly reassuring to hear that this American taste has not been embraced even today. I can make my own ice cream, though it is not cost effective anymore to buy cream and eggs. Though I know the taste is better in hand made batches. This week a pint of Haagen Daz is $1 with a coupon in NJ. David, Do you find there is much of a cost difference in buying ice cream in a store in France vs making your own? I think that requires at least one childhood summer camping next to a firepit, burning your fingertips on molten goo. The French have a different memory base, likely. But surely they camped? It would be great to know what their campfire treats are! Woah I need this in my life. I’m with you David, char that marshmallow, it is way better that way! First let me say that I cannot wait to make this recipe! I love the use of speculoos, which are some of my favorite cookies of all time! Secondly thank you for being so hilarious! The process of taking photos while attempting culinary techniques often leads to mishaps in my kitchen; glad to know I’m not alone! I have to say, I see a lot of photos on blogs, and social media, where two hands are making something. So I am assuming they are getting help. I like to take all my own pictures so sometimes need to balance what I’m doing with trying to press the shutter button! I love the idea of s’mores and I crave them (and any dessert that was inspired by them) even though I find the traditional ones way too sweet for my taste. Your ice cream looks and sounds delicious plus I’ve read you say that you dislike desserts that are too sweet so I’m hoping this ice cream won’t be too sweet. Ice cream needs to have a certain amount of sugar/sweetness. Otherwise it’ll freeze too hard, unless you use stabilizers. (Which I don’t.) The fudge ripple is quite bittersweet so it balances it all, but marshmallows do have a certain sweetness so this may or may not be the ice cream for you. This looks wonderful and so easy (as long as you’re not trying to photograph at the same time) How come you’re not chubby ?!! It’s processed factory foods and unlimited portions that make people fat – you really have to work hard to get fat eating whole foods, made at home…as he said, store-bought marshmallows are a rare inclusion! Wow! I did this flavor just this week, what a coincidence! But mine featured the marshmallow base, shortbread cookies and a runny chocolate sauce. Loved it but will give your a go as well. On the note of burnt marshmallows, I’m a bit uncomfortable with steeping them in milk cause what flavour will it yield: sweet or murky sweet? I don’t know.. Just mixing toasted marshmallows in ice cream is totally delish though as I ounce did with a dark chocolate ice cream for a marshmallow hot chocolate ice cream flavour, it was lovely! I’ve never had S’mores ice cream, but my favourite dessert of all time is a hot fudge and marshmallow sundae. Gina; you have reminded me of a favorite childhood treat. Bailey’s was an ice cream & soda fountain in downtown Boston that served the best ice cream sundae: vanilla ice cream, deep dark hot fudge, all covered with marshmallow dripping onto the plate the metal sundae dish was placed. Thank you. Irma, Bailey’s was the best! I remember trying to scrape up all of that marshmallow sauce that had overflowed onto the tray. Food memories…sigh. As teenagers we enjoyed Black & White Sundaes at Albert Sheetz. Two big scoops of ice cream side by side in a longish silver dish. 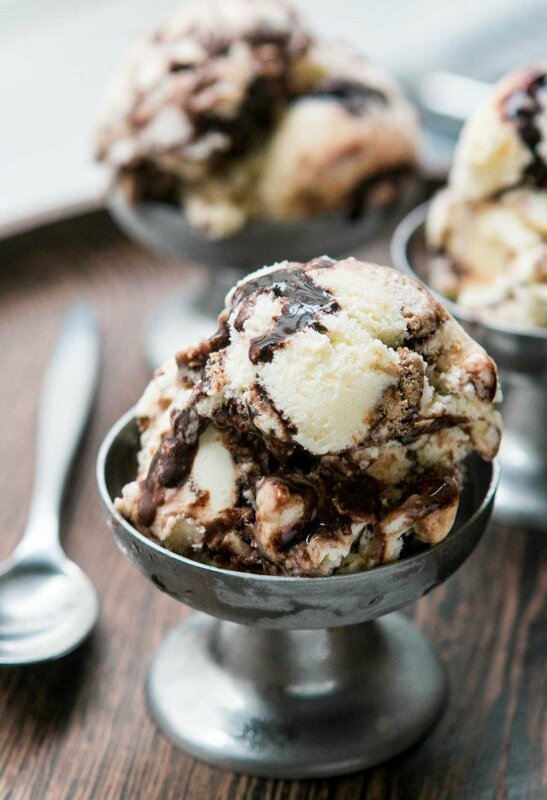 One big scoop of vanilla wearing gorgeous chocolate fudge sauce . Next to it a big scoop of chocolate covered with marshmallow sauce. On top the best whipped cream and a few chopped nuts. Yum. Word on skipping on the homemade marshmallows qqf. They are exponentially better, but my recent attempt to make a bergamot-flavored batch burned out the motor on my Hobart stand mixer, which will likely cost me $$$ to fix. David, if you ever happen to be in Toronto, go to Greg’s Ice Cream on Bloor near Spadina and try their roasted marshmallow ice cream. I don’t know how they make it, but it’s got a roasted flavour that hits you (deliciously) over the head. This is great! I made Deb’s s’mores cupcakes (http://smittenkitchen.com/blog/2015/10/smore-cupcakes/), so I have to make this ice cream now…and as far as your macaron thought … I have not made these, but they are on my list! 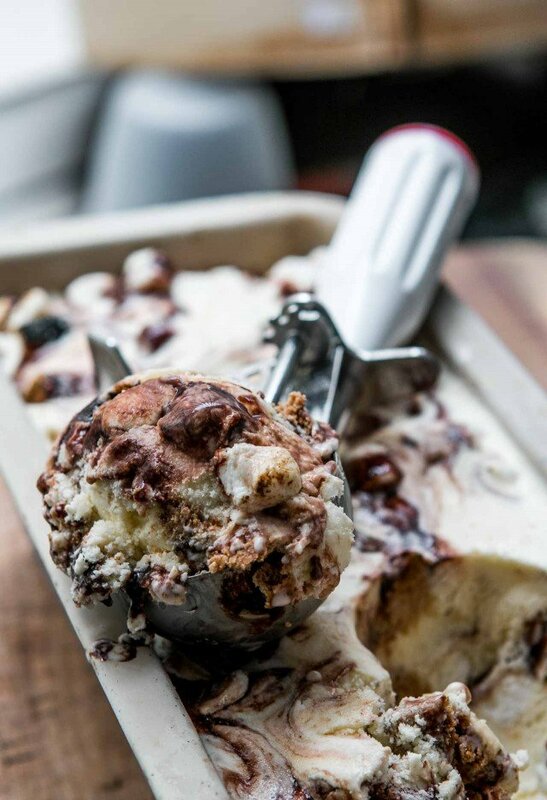 S’mores are here to stay…ice cream is a brilliant idea! Oh, my! You’re devil. I really, really want it now. Carbonized marshmallows rock! At another staff meeting that could have been shorter with some emails, I shared the blog entry with a few others near me. Lots of quiet “oooo’s”. 1. Kristin (et al), if you’re somewhere where digestive biscuits are common, then you can probably also get malt biscuits, which I think would work really, really well. They’re crisper than digestives, with a stronger flavor, and more like graham crackers to my taste; I think they’d be delicious. 2. David, I hadn’t realized that aluminum-free baking powder was such an uncommon or American-particular thing until moving overseas and discovering that I can only bake very strongly flavored baking powder-ed things because the horrific chemical flavor makes anything else inedible. Grrrrr…. I make my own (though the baking powder where I am is still substandard), but if you find a decent European brand you should let us all know. After many, many, many years we reprised s’mores this summer. They were SO good! There is a reason for their longevity. After our company left, I could see through the window the embers were still glowing. I crept outside and made another! Will certainly be making your ice cream. You had me at s’mores! I’m now craving something sweet at 9am- can’t wait to go home and try this! It sounds like you may be starting a s’more trend over in France. 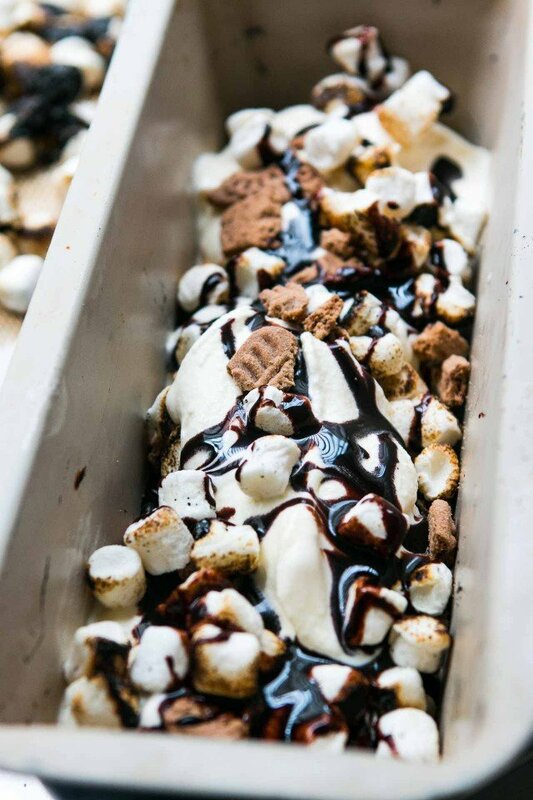 Over here in America I don’t care if they’re approaching cliche level of ubiquity (which I didn’t know they were doing either), I love my s’mores and now will be dreaming about this ice cream. Though I may try to toast mine in my broiler. This looks fabulous! I love making homemade ice cream and recently made a s’more version too, using your chocolate Philadelphia style recipe but added milk chocolate- it was wonderful! I was wondering what pan/container you use to store and freeze your ice cream in? I’m not satisfied with what I’m using now. Thanks!! I bought a big case of professional plastic ice cream container when I wrote my ice cream book, and I’ve been using (and re-using them) ever since. However I did buy one of these Tovolo ice cream containers when I was at TJ Maxx in the U.S. on my last trip, since you can take big long scoops in it. The make other ice cream containers too that look interesting! Another vote for the Tovolo containers AND their scoop, also. The long containers are easy to scoop from and that size happens to work very well in my freezer. I bought some of the tubs as well. I made ice cream for neighbors and they both commented that the tubs were easy to open from the freezer vs their own plastic ware. It is only me and I don’t eat a LOT of ice cream so a quart lasts 2-3 weeks. I’ve had no problem with crystals or bad taste near the end. This is the best ice cream ever and I have made many. I can’t seem to stay out of it! The Tovolo containers are the best. I have 3 so there is no need to wait to finish one flavor to move onto the next flavor. I’ve only made Marshmallow sauce for topping (the recipe is in my book, The Perfect Scoop) but not a swirl. I think you need to use quite a bit of glucose or corn syrup to get it not to freeze and to still be soft, and some people don’t like to use those things so much. I am in awe. You are an absolute genius. I’m completely speechless. Thank you. This ice cream looks absolutely divine. I love the idea of using gingersnaps for a bit of added spice. My wife and I were recently in SF and popped into a chocolate shop. They did a simple smores that was incredible. 1 graham cracker, one toasted marshmallow, and a square of chocolate from Sierra Leone. It was perfect. That’s a real one, Sparrow. Except that the originals used a square of Hershey’s Milk Chocolate bar. Girl Scouts made then while sitting around a campfire. David, one of your most entertaining articles ever! You drew a perfect word picture of your contortions to toast and photograph the operation simultaneously. Hilarious? We can all relate to that kind of thing. We can also relate to the “specific tools” that clutter our kitchens (and the price of which we’d rather not think about). The notion that S’Mores have disappeared is nonsense. I remember them from childhood and that has been a while. It amused me when they became trendy. Now they may slip back into the relative sanity of being comfort food. Stuff we loved as kids and can enjoy as adults. And the recipe sounds great. Since you are using Speculoos (Spekulatius here in Germany where Graham crackers are not common either), the ice cream definitely will be the first I make – Hello, Christmas flavours! Ooo this looks good. I do like my marshmallows toasted an even dark tan, the color of the speculoos so they are nearly molten inside a leathery tan shell. Stir that in your chocolate ripple, yeah! Yours look like they are still bouncy and that must be a delicious texture contrast. Bet this was heavenly. David we just finished making this incredible s’more custard. Everything tastes amazing but the mini marshmallows were a disaster. We torched them but they all stuck together on the nonstick foil that was used lining a cookie sheet. We definitely need suggestions on keeping the minis intact. Thank you for the wonderful recipe! I’ve not used nonstick foil so can’t advise. I used a silicone baking mat which worked well. I don’t think it’s bad if they stuck together – you could just lightly oil some scissors and snip them apart in to pieces, and mix them into the ice cream. They don’t need to remain distinct in the ice cream, as once scooped, it’s nice to have irregular pieces and bit of marshmallows here and there! I made this over the weekend – no torch so I put the marshmallows on a half sheet with silpat and put them under the broiler until some had black edges. Yes, like Ann’s they stuck together in a gooey mess, but I used a silicon spatula and kind of scooped enough for each layer. As you say, David, kind of fun to bite into a crispy marshmallow bit here and there. Ann, don’t fight it … just work with the goo :) !! I’m new at ice cream and this was my first with bits and a swirl – a lot of fun to make. A little goes a long way (rich and sweet). Hi David! I rarely comment if there are already more than 10 already posted but I made this recipe this weekend and OHMYGOD was it good. Thanks for another wonderful ice cream recipe!! Oh. My. Goodness! I love s’mores and I love ice cream. Definitely digging your use of specaloos! I may have to pick some up at Trader Joe’s and try this out asap. Thank you for all of your amazing recipes! My brother and I made this yesterday, and it is incredible! We were a little nervous about the marshmallows being chewy as we toasted them in the oven, but everything melded together perfectly. Thank you for this recipe! I made this last night (well finalised the assembly) and it is fantastic! It’s my first ice-cream of the season and i’m looking forward to a long Australian summer trying some new recipes. I didn’t have fuel for my torch, so I put the marshmallows on a baking tray under the grill and it worked fine. Make sure to space them out though, the first batch melted into a single blob and i had to cut it up with scissors once it cooled!